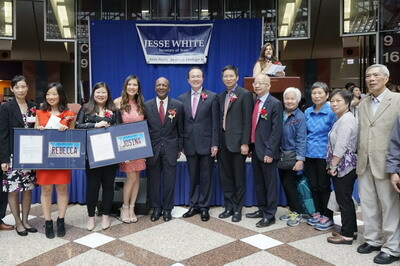 On May 15, 2018, Consul General Hong Lei attended the 2018 Asian-Pacific American Heritage Month celebration hosted by Secretary of State Jesse White at the James R. Thompson Center in Chicago. More than 100 guests including Consul Generals of India, Thailand, South Korea and other countries attended the event. Deputy Consul General Yu Peng also attended the event. Secretary of State Jesse White presented heritage month awards to individuals and organizations who have made extraordinary contributions to their communities. Secretary White hoped that the awardees will continue to work hard to serve their communities and help others to contribute their own strength. He also emphasized the importance of instilling a sense of love and responsibility in the new generation to help further advance the prosperity and development of the Asian-Pacific American communities. Consul General Hong Lei thanked Secretary White for hosting the Asia Pacific American Heritage Month Celebration which holds great significance. He said that the awardees are distinguished individuals from the Asia and Pacific American communities who have made important contributions to society. They are representatives of their communities and their speeches are very inspiring. Consul General Hong lei said that he believes the event will promote the unity, harmony and welfare of Asian-Pacific communities. Since the 1990s, states across the United States have held Asian-Pacific American Heritage Month celebration in May each year. Governments at all levels take this opportunity to commend individuals of Asia-Pacific decent who have made significant contributions. This year's celebration in Illinois presents the “Humanitarian Service Award”, the “Judge Laura C. Liu Trailblazer Award”, the “Humanitarian Excellence Award”, the “Volunteer Achievement Award” and the “Community Leadership Award”. Three awardees are Chinese Americans.